opening more happy mail - the arrival of some more swap envelopes - here's how they all look together so far. Hoping your week is going well too. Friday night at the movies with a friend. sewing for The Fox Swap, two down, two to go. Pattern from here. my bedside table - a lovely pile of new books and poppies from my garden. close up of the above-mentioned poppies. cupcakes in progress for school cake stalls this week - I ran out of papers for them so cut 5" square of baking paper to line the tins. Icing and decorating with popping candy, is tomorrow night's job. Late afternoon in my backyard - the rainbow chard is still growing well and there are lots of juicy lemons on my small tree. water damage in our bedroom from the leaking hot water cylinder - the cylinder has been replaced, now we are waiting on builders to decide what happens to the floor and still damp wall. small block sewing - scaled star from this tutorial and playing with some Heather Ross frog fabric. happy mail in the form of two envelopes for the SWAK Swap. a finish - the top of Mr J's shirt quilt - he has been home sick all week, so I have been able to get this completed, now just the back to piece and a quilt label to embroider for it, before all the dreaded basting and quilting has to be done. taking time out with a cup of tea, some home baking and a new book from the library. Hope you are all enjoying the little things in life too. Way back in January - I got my own sewing room, at the time we were looking for an old wooden door, to turn into a cutting table for me. One at a good height so I didn't have to bend over to much. 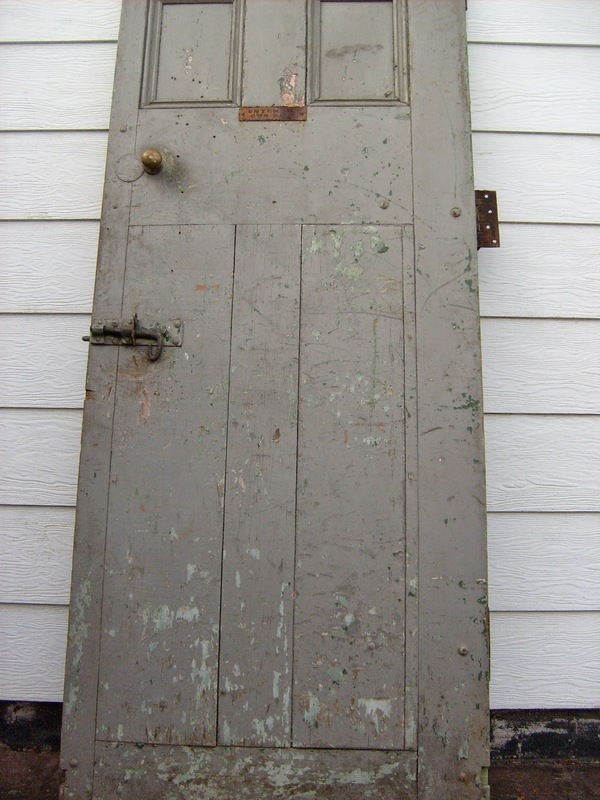 In March we bought an old kauri and rimu door for $1 off Trade Me (similar to EBay). Over the past few months, The Scout has been sanding it back to the natural wood underneath, and patiently waiting for me to finalise my ideas for it. This weekend it was finished. We have left it as natural wood, no oil or varnish on it. 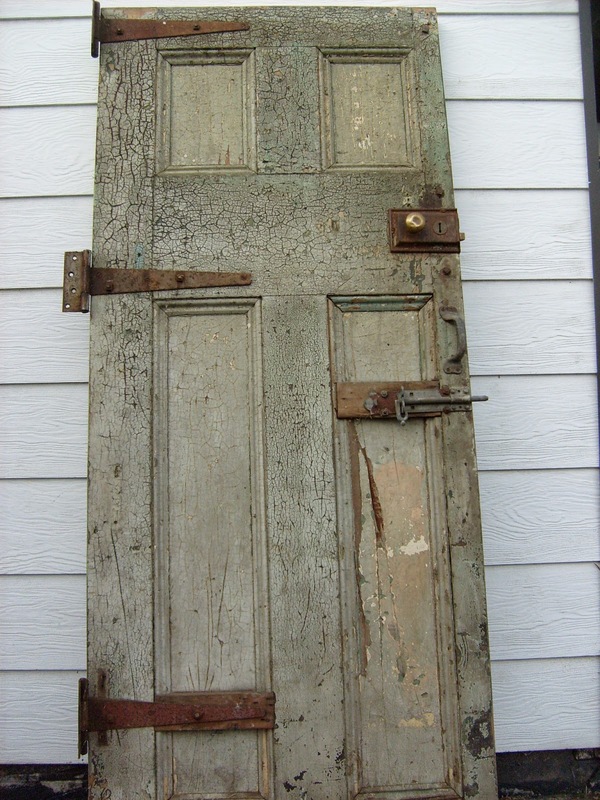 Where there were hinges, bolts or door handles, a little of the old paint or sanded back bolts have been left for character. Underneath he built in some shelves to store my fabrics, I will probably paint these the same very pale aqua, that other shelves in the room are painted in. I will also get new storage containers, so that I can store fabrics by colour/designer, rather than lumped in two containers. Its dimensions are roughly 85cm high x 140cm long and 80cm wide. I am so thrilled to have it completed, and very lucky to have such a handy husband. My mini quilts have been hung up too. The only thing left to do now, is to cover the little old brown armchair that sits in the corner of my sewing room, and of course crack on with some sewing. Of course, it will probably never look this clean and tidy again. Hope you have all had a fabulous weekend. over 350 6.5"x 2.5" strips have been cut from shirts obtained from The Scout, Mr J's grandad and various op (thrift) shops over the last 12 months. It was not as easy finding good quality 100% cotton shirts as I thought it would be. 104 rail fence blocks have been sewn and laid out as above. Sewing - yes I have officially started Mr J's shirt quilt. 60 blocks have been sewn, and there is probably at least another 50 to make. He is delighted to finally see how it will look, very roughly laid out, and has insisted that some of the blocks be replaced with shirt pockets. I am intending to make the quilt back from fat quarter size pieces of some of the shirt backs, and yes, apparently I have to include a pocket or two there also. these beautiful frilly camellias - picked from my neighbour's garden. I have them floating in a bowl on my dining table. being organised and cooking dinner early - tonight a savoury tomato mince rice bake and coleslaw. this fabulous pile of cookbooks - I am especially looking forward to making some treats from Gran's Sweet Pantry - which is a New Zealand cookbook too. my pile of bedside reading - currently I am reading The Name of the Wind by Patrick Rothfuss. I am not really a fantasy book reader, but thought I had better try some different books and genre, now I am working for the library. This was recommended to me by one of my co-workers as a good series to start with. I am about 60 pages in, and so far I am enjoying it. another shot of this beautiful camellia. Hoping you are all having a great week - not long till the weekend now. Finished - one cockatoo cushion. This is going to be a green loving, bird mad, nephew's birthday gift. I decided to use batik, for the background, because it gave the impression of a bird looking out of leafy branches and a slightly tropical feel. A strip of green Kona cotton breaks it up and I have bound it in the same fabric. Quilting is just four straight lines each side of the inset green strips The backing is the batik too and it has a concealed zip. I am really pleased with how this has turned out, hopefully my nephew loves it too. one finished Cockatoo - now to finish the cushion. Love how this bird has turned out. a postcard sent by my flickr friend Emma from Italy - I remember sitting at the bottom of these steps many years ago - eating my lunch and watching the world go by. using up some of the abundant celery from garden in this soup. glorously bright green and gold leaves on one of my geraniums. Hoping you all had a wonderfully relaxing weekend too.